Nothing says welcome-to-the-future like a full surround sound system—but nothing says it’s-the-20th-century like speaker wires running all around the living room. Luckily you, thanks to wireless speakers, don’t have to re-wire your house to get rid of them. 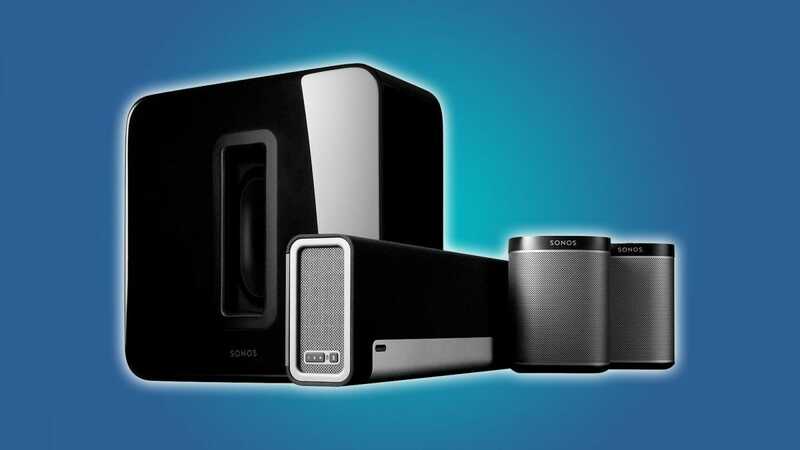 There are a few surround sound kits that are wireless, at least for the rear 5.1 speakers, so you won’t have to worry about connecting the most cumbersome components. 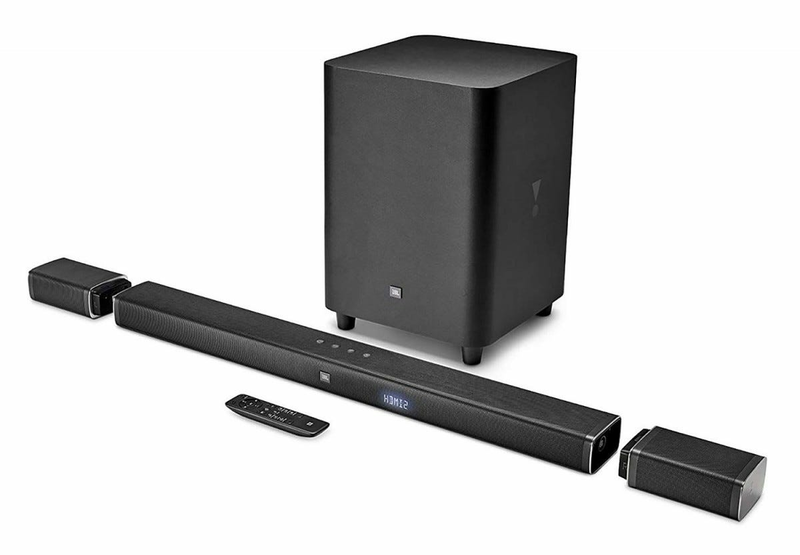 And a few soundbar kits, like the Samsung model below, offer upgrades for wireless rear speakers. For those who prefer the speakers they already have but don’t want a permanent installation, we’ve even found an adapter kit that can turn any speaker wireless with conventional A/V hookups, no Wi-Fi or Bluetooth required. On its own, this JBL soundbar looks like a conventional design, with a single central speaker bar and an included wireless subwoofer. But it’s hiding a secret: both ends of the bar pop off, with the rear speakers hiding an integrated wireless connection and even built-in batteries. It’s an elegant solution if you’re interested in wireless because you only watch surround sound content some of the time. The Bar 5.1 isn’t skimping on features or power, either. It includes support for Dolby Digital surround, DTS, and Pro Logic II (though Atmos isn’t supported), and the package includes an impressive 510 watts of total power. 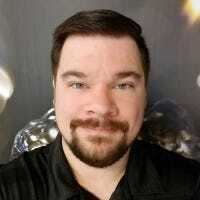 Three HDMI connections and ARC support mean it will integrate easily with a simple TV or a full home theater setup. In fact, all you need to plug in are the power cables for the bar and subwoofer and an HDMI cord: everything else is ready to go. If you want a simple wireless sound system and your budget won’t stretch for the Sonos upgrade we’re about to look at, this is an excellent choice. Sonos knows a thing or two about wireless speakers: everything they sell connects through their proprietary Wi-Fi system. If you’re looking for premium home audio that also integrates with a multi-room music setup, combine the Sonos Playbar, Sub, and two Play:1 individual speakers for a full 5.1 setup with all-wireless components. The set is available as a combined retail purchase. All of Sonos’ individual speakers are high in component quality, though the direct connection to your TV is limited to optical cable. (Depending on your existing setup, you may be able to get wireless sound from a smart TV.) All of it is controllable via a standard TV remote, or the Sonos app on your phone, or voice command via Amazon Alexa. And if you’re ready to expand to the rest of your home, add extra Play:1 speakers (or any other Sonos speaker) and they’ll integrate automatically. If the choices above are outside of your budget, check out this Samsung model. The Series 3 is a standard soundbar with a wireless subwoofer: 200 watts of power for a reasonable $170. But you can also add on a wireless pair of rear speakers designed specifically for the Series 3 for an extra hundred. Bundle the purchase at Best Buy and you get a discount, bringing the whole package to just $240. Note that the wireless upgrade uses standard speaker wire to connect the wireless station to its satellites, so it’s only wireless in that it doesn’t need a hard connection to your television. But on the plus side, it will work with larger, more powerful satellites if you have them available. Those who want to use their existing speakers without wires have limited options, but this BIC America kit is the best among them. It uses a base station and receiver to broadcast a short-range wireless signal and output it to standard RCA cables. You’ll need one pair of transmitters and receivers for each wireless speaker. The system will work for 60-80 feet, depending on the layout of your room, and up to four can be used at once for wireless left, right, rear-left, and rear-right satellites at once. Each pair comes with a good selection of RCA cables and adapters for easily fitting into most home audio setups. It’s an expensive solution, but if you’ve already invested thousands in your existing speakers, it could be worth it. Physical media isn’t quite dead—those who want the best possible hi-fi playback, or who don’t have an internet connection that can handle HD video reliably, still use Blu-Ray players. Here are the best picks.